From the bestselling, award-winning author-illustrator team of Doreen Cronin and Kevin Cornell comes the first book in a heavily illustrated, hilarious chapter book series about the adventures of a dog detective. Perfect for fans of Sara Pennypacker's Clementine series and Jarrett J. Krosoczka's Lunch Lady series. J.J. Tully is a former search-and-rescue dog who is trying to enjoy his retirement after years of performing daring missions saving lives. So he's not terribly impressed when two chicks named Dirt and Sugar (who look like popcorn on legs) and their chicken mom show up demanding his help to find their missing siblings. Driven by the promise of a cheeseburger, J.J. begins to track down clues. Is Vince the Funnel hiding something? Are there dark forces at work—or is J.J. not smelling the evidence that's right in front of him? The Trouble With Chickens by Doreen Cronin is an adorable children’s chapter book. J.J. Tully had a fantastic career as a search and rescue dog, and from the start of the story, he is currently enjoying retirement. As this is a story, we know things don’t stay quite so peaceful for J.J. One day two chicks, Dirt and Sugar, and the mother hen, Hazel, come to J.J. asking for help in tracking down the missing siblings with the promise of a cheeseburger for a reward. So, this isn’t my normal type of a read at all. But the word chicken was in the title and I have an inside joke with my friends about chickens, so I snapped up The Trouble With Chickens at BEA. I wound up reading Doreen Cronin’s book for the Dewey 24 Hour Readathon. It’s actually pretty fun for a children’s book. The Trouble With Chickens reads like an old time mystery, but with animals. Sort of like,Hercule Poirot, but with a German Shepherd and less refinement. It’s entertaining if your sense of humor is like mine. I mean, hell there’s a dog with one of those neck collar brace things, and it’s the bad guy. Totally awesome. J.J. Tully, the main character, is very brave. He’s also humorous, because he takes everything so seriously and guys it’s kind of hard for me to take dogs seriously. 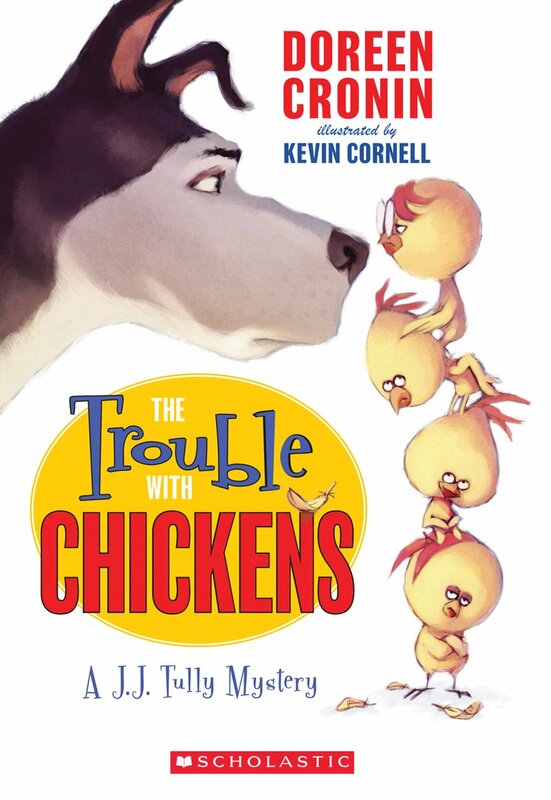 The Trouble With Chickens is definitely a cute book and I think children will enjoy it. Disclosure: Picked up at BEA. one of my college years, my friends and I decorated our bathroom in chickens. We even put up the Chicken limbo and everything! We’re a very Cronin-friendly house…what with three little Bookworms here and all. Wait, is this a Cronin CHAPTER book?